Perhaps every dedicated gardener in the world knows about Borage, the Mediterranean plant extraordinaire beloved of pollinators. Useful medicinally and as fertilizer, it also decorates cakes, flavors gin, and stuffs ravioli; every part of the plant except the roots can be consumed. We have Italian friends in Austin who grow borragine in their yard. I find an unintended (?) ambiguity in your post’s title, especially given the capitalization of Tea Party. Absolutely unintended. In fact, if the possibility of ambiguity had occurred to me, I would have chosen a different title. On the other hand, now I’ve had this amusing thought: the weed called Politico creepis is showing up everywhere. Have you had any dishes prepared with the plant? I haven’t had any dishes prepared with borage, at least not knowingly. As for the weed you mentioned, no question that it has spread. I see no end in sight. At least Morton County, Kansas is taking the direct approach. Interesting plant and it has a pretty blossom. It’s not found here that I know of, but I see it grows in the Pacific Northwest west of the Cascade Mountains. I suppose it’s the more temperate climate on the other side of the Cascades that allows it to thrive. The plants I found were so covered with flowers it was hard to isolate one or two. When I read about the plant, that was one quality that was often mentioned; it’s a prolific bloomer. Thank you, Pete. I was surprised and pleased by that blue-on-blue. I’m glad you like it, too. I see that borage will grow in your area, but I also read that it will spread like crazy, and take over a garden in only a few years — so perhaps it’s not a plant that would suit you. On the other hand, it’s said to be great for pollinators and to do well in containers, so I might give it a try myself. Such pretty photographs! I don’t know whether I prefer the blue background or plants in the background – both are lovely. It’s a plant I’m only a little familiar with, so it’s fun to hear about the different flavors. And always a pleasure to see that color! Despite our bluebonnets, and the loveliness of iris, and some of the sages, blue flowers aren’t my favorites. But I do like that first photo, with the unusual sky, and I like the way the maroon stems and sepals complement the flower. The center of the flower in the second photo looks to me like a fanciful creature with pink eyes, sticking its tongue out at us. One suggestion for using the flowers is to freeze them into ice cubes for garden parties or bridal showers. It’s a little chichi for me, but it would be pretty. :-) yes, garden parties…I don’t have too many of those! But you’re right, it would be pretty. The colors in both photographs are really lovely, and unusual – that olive green – they aren’t colors you’d think to put together necessarily, but there they are, and they’re so elegant. This is a new one for me. Perhaps it doesn’t grow here?? At any rate, it’s quite lovely, especially with the little bristly things sticking out everywhere. They’re soft, not thorny, right?? Since it’s introduced, it’s naturalized in only a few counties there. Mostly it’s planted in gardens for the pretty flowers, or to use in cooking. People plant it just like they would any other herb. The hairs are stiff, but they aren’t prickly, if that makes sense. Even the leaves have those stiff hairs. I wondered about that before I ate one, but I didn’t even notice them. I’ve never grown borage, but have always liked it. I didn’t know the flowers taste like honey. I guess it would make sense for me to pick a flower and plop some of my bees’ honey on it? Beautiful photos! From what I’ve read, it’s a fantastic plant for pollinators of many sorts, especially bees. You might be interested in this article. By the time I finished it, I was ready to plant some myself, although if I had a garden like yours, that self-seeding tendency might make me cautious. Still, the number of bees buzzing around while I was taking these photos does suggest they adore the plant. The photos are quite lovely, Linda. I like the blue on blue because it shows more detail of the plant. I have always wanted to grow borage but somehow it escapes me every year. I forget to plant this one but I would not plant it for culinary use. I’d just enjoy the flowers which are so pretty. Not only are the flowers pretty, the plant is a good one for pollinators. You might enjoy the article I linked to in my comment to Tina, just above. As I mentioned to her, the flowers were attracting bees when I took these photos. I think it’s an easy plant to grow, too. My friend had it in her formal herb garden, but collected some seeds and just threw them out on the land to see what would happen without any particular attention. What happened was that she got more borage, and a good bit of it. Thank Linda, I’ll checkout the link. Also it is good to know that borage is easy to grow. I like that it attracts bees. I like to plant things that attract bees and other pollinators. Presently bees are coming to the black basil or African Basil which I plant every year. It does not tolerate freezing temps so I must replant a few each year. Here’s another little tip for you: it’s an excellent fertilizer. It can be chopped back into the earth, or a “tea” can be made with the leaves to use as liquid fertilizer. You can read how to make and use the liquid fertilizer here. You’re certainly not going to be using borage as a cover crop (!) but since it can be container grown, that would still provide enough leaves for you. I grew this when I first gardened and then thereafter. My favor trick when showing visitors around the garden was to pop a flower into my mouth and watch their expression. It was in the days when eating flowers was rare and now thankfully we’ve moved on. Culpepper said of Borage it lifts the heart and gladdens the spirit-I think that’s the quote anyway. Your image has done just that for me today. I’ve never been much of a flower-eater, but I must say the borage flowers were great. I’ve tried nasturtium and violets, and after coming to Texas I was introduced to yucca blossoms, but that’s about it. I was browsing an article in Southern Living magazine, where I read that the borage flowers taste like cucumber. Of course, it’s the leaves that taste like cucumber, while the flowers are sweet. Their fact checker must have had the day off. It’s yet another reminder to always use more than one source. I did find a lot of references to the ability of borage to cheer, lift spirits, ease melancholy, and so on. Who wouldn’t love a plant that could do that? I’m glad that the plant’s power can come through a photo, too. I love the delicate blue of the petals. Don’t know that I’d be all that keen to eat it, though. Much rather leave it on the plant and just admire it. It was fun to sample the taste, but I’d rather enjoy the flowers, myself. I was interested to learn that it’s one of the few truly blue flowers around. When I looked at a page showing “blue” Texas wildflowers, I was reminded again that most of them appear more lavender to me. Of course, that carries memories of a song from our earlier years. Remember “Lavender Blue”? I see the court jester now. All we’d need do is hang a little bell at the end of each petal, and we’d have it. What a fun image. It is amazing what the camera can do even with an inexperienced operator, isn’t it? I found a class in macro offered through Creative Live, and purchased it so I can work my way through the lesson at convenient times. It will be interested to see whether it was worth the $20 or so I paid for it. I like your gardener friend! I have never grown borage, though I may (or may not) have seen it.) I’ll have to look into it for next spring if it grows in our climate. The flowers are exquisite! I would be very surprised if Southern Exposure doesn’t have it in their gardens. It’s not native and tends to disappear after a few years wherever it pops up, but as a garden plant, it’s quite common. It’s apparently such an easy grower it might even do well for you at the lake. You could plant early in spring when you open, and have flowers all summer. You’d be the hit of the neighborhood with those flowers in your ice cubes. I can attest that borage will take over a garden. It’s taken over mine. But I don’t mind and the bees and the birds don’t mind either. The birds come for the borage seeds. When it comes to the eating of borage, I don’t care much for the leaves but I do like the flowers. My flowers do taste like cucumber, so I often make a tomato, borage, and arugula salad. 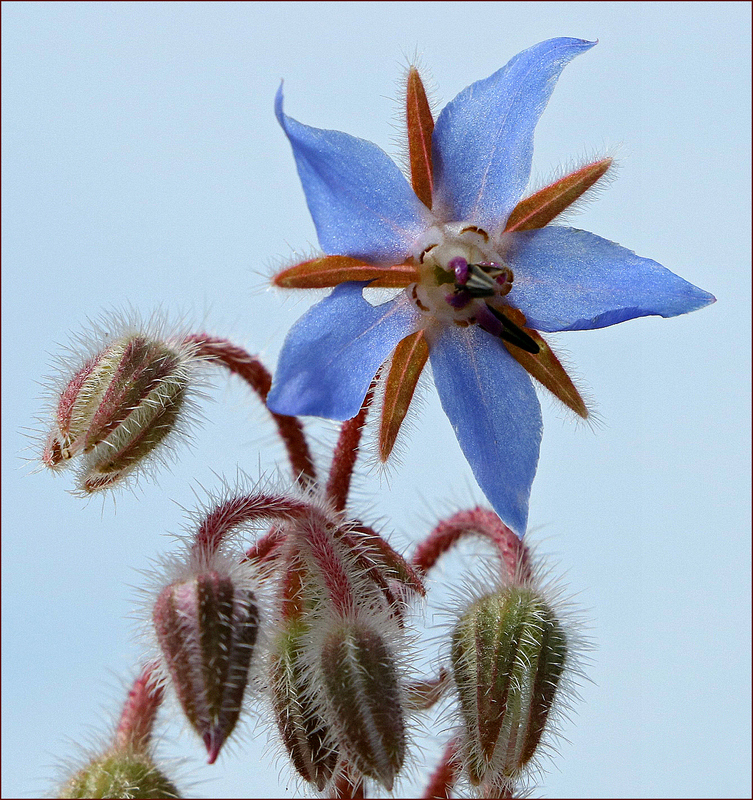 Borage is one of my favourite plants and you have captured its star status beautifully! Every article I read save one said that the leaves taste cucumber-y, while the flowers are sweet. I wonder if the age of the flowers make a difference? It might be that cucumber overcomes sweet, in time. I’m always interested in the plants that we share in common, and I’m glad we can add this one to the list. There’s no question that the pollinators love it, and good to know that the birds enjoy the seeds. Have you ever seen the white? I’ve read that there’s a naturally occuring white version — not a cultivar — and I’d love to see that. I might even try some of that in a pot if I could locate some seeds. My “gardening” at this point is mostly cactus, which have the dual advantages of sticking it out during the heat of the summer, and not requiring much care. I haven’t seen the white but I do know that the borage flowers change colour according to age, meaning that on one plant you can have pale mauve to deep blue. Borage is very hardy; a good companion to cactus I would imagine. As for the cucumber taste, I wonder if it could be affected by soil and growing conditions. Hmm….I have just been outside to taste test my early borage. Neither flower nor leaf has much taste at all! Have you tried borage honey? No, I haven’t. Of course, I didn’t know there was such a thing as borage honey until about two days ago. However: thanks to the magic of Amazon, I could have myself a jar of Blue Borage Honey from the South Island of New Zealand, delivered right to my door. Isn’t life amazing? I’ll have to put off my taste of your land for a while — that’s a little pricey for my budget. On the other hand, when my aunt asks what I’d like as a Christmas gift this year, perhaps I’ll make shopping easy for her. Ah, well, it will have to be a virtual taste for the time being. Excellent photo, very cool, electric and festive-looking. I love PhilosopherMouse’s comment above about the Elizabethan court jester, that’s just perfect. I just had my first cucumber sandwich this weekend – – visiting my sister, we went to see an art exhibit in a greenhouse at an old estate, and had lunch there, with the high society crowd. Found out the upper crust cut the crusts off their sandwiches? I should hang around the back door of the kitchen, the crust is my favorite part! But I really liked cucumber sandwiches. Not as much as pastrami, but still nice. You would have fit right in, because I wasn’t so fond of the crusts — you could have had them all. Inquiring minds want to know: was it plain cucumber you had, or cucumber and cream cheese? That’s pretty good, even though I’m not all that fond of cucumber. Just butter, I think, but actually tasty. They also had tiny little egg salad ones, salmon, scones with cream & jelly, and cookies. It was kind of like a kid’s tea party but my sister loved it. The only problem with grazing on borage is that I’m not so fond of cucumbers. I’ll leave it for the pollinators, and find myself some nice alternative — although the idea of the flowers in ice cubes or a nice Pimm’s cup isn’t so bad. 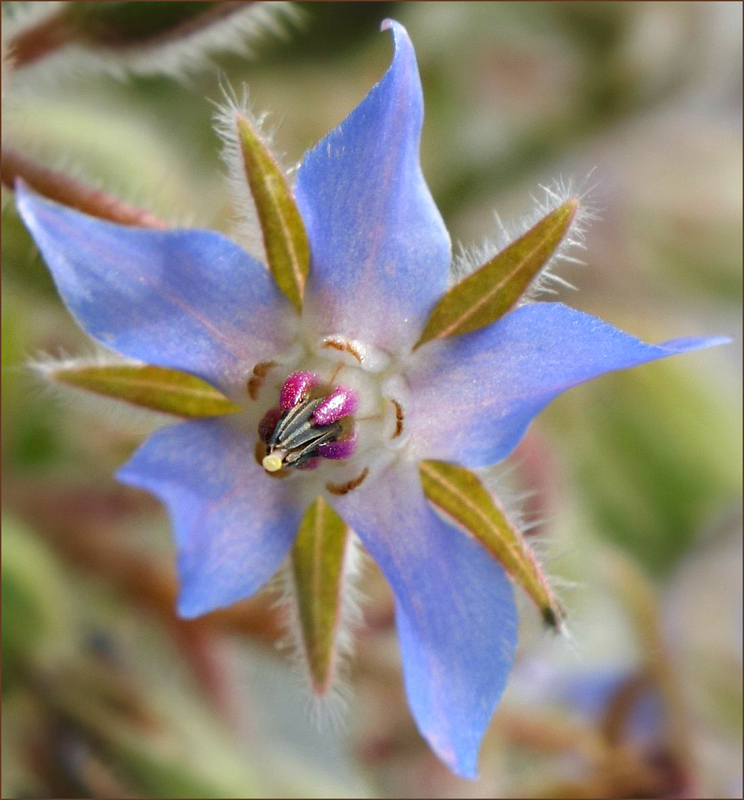 I love borage, especially images of the spiky-looking buds(?). I used to grow it when I had a large herb garden many years ago, but never actually ate any of the plant parts. I just love blue flowers. I came across some photos of the plant from Melbourne while I was browsing the articles. It’s such a nice one, and I’ll bet it thrived under your care. I’d not realized how uncommon blue flowers can be — given that you’re such a fan of blue, this would be one I’d expect to find in your garden. I like the flowers, but those buds just knock me out. I truly enjoyed this. What an intricately shaped flower. Isn’t it pretty? When I first met it, I thought it would be prickly, but it isn’t. The hairs are stiff, but not sharp. When I nibbled on the leaf, which also is hairy, they weren’t even noticeable. Everything about its shape is pleasing, and it’s nice to see a blue flower which truly is blue.